There is a lot of talk about New Zealand and Rugby these days. No doubt because of the spectacular success of the 2011 Rugby World Cup, recently hosted by the Kiwis. 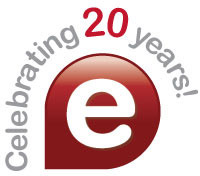 Nelson based Envisage Design have a long history in producing prestigious publications for sport memorabilia publishers Hill Verdon. These truly are remarkable books. 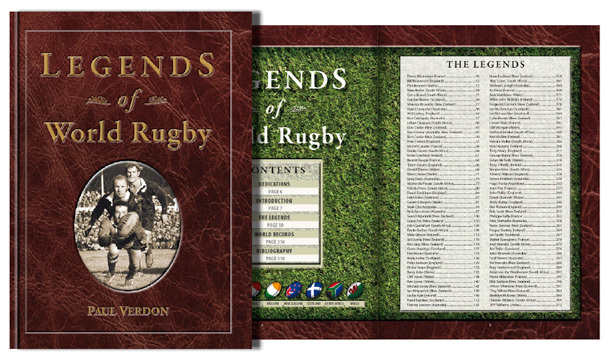 Cue ‘Legends of World Rugby’, published by Paul Verdon in 2005, and designed by Envisage. 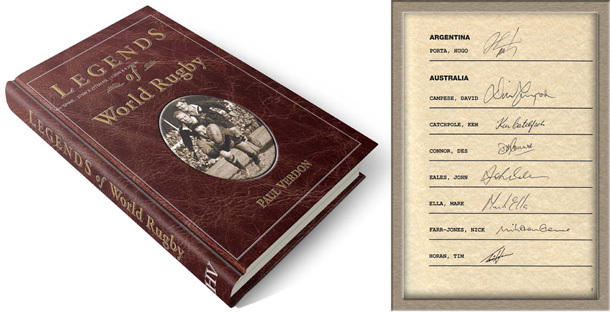 Legends of World Rugby, is a strictly limited edition 320 page book, cigar-box bound and personally signed by the world’s greatest players from the amateur era. Has there ever been a book produced like this? Not likely! Yes, these Limited Edition books were signed by 74 of greatest players from around the world from the amateur era. Signatories include Colin Meads, Gareth Edwards, David Campese, Hugo Porta, Frik du Preez, Michael Jones, Naas Botha, Willie John McBride, Tony O’Reilly, Sean Fitzpatrick, Cliff Morgan, Joel Stransky, JPR Williams and Jackie Kyle. Legends is only one of many such Collectors’ Edition books Envisage have designed for HV Publishing. Other titles we have had the pleasure of designing include ‘Olympic Legends’, ‘The Immortals’, ‘Kings of Rugby’ and ‘The Immortals, the Book of All Black Test Players’. Each limited edition copy retails for around $699. There may still be a few left at Hill Verdon Publishing Limited.